Get Your Customized Automated Security Awareness Program, ASAP! 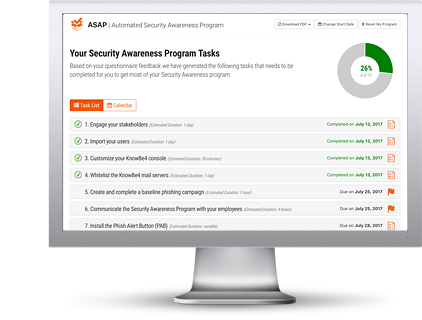 We’ve taken away all the guesswork with our Automated Security Awareness Program (ASAP). ASAP is a revolutionary new tool for IT professionals, which allows you to create a customized Security Awareness Program for your organization that will show you all the steps needed to create a fully mature training program in just a few minutes! The program is complete with actionable tasks, helpful tips, courseware suggestions and a management calendar. Your custom program can then be fully managed from within the KnowBe4 console. You also have the ability to export the full program as a detailed or executive summary version in PDF format. This is great ammo to help you get budget and reporting to management. The process of creating the program is simple enough, answer between 15-25 questions about your goals and organization, and a program will be created and scheduled for you automatically. The tasks will be based on best-practices on how to achieve your security awareness goals. You have an easy calendar view to plan and deploy your security awareness program. Find out what YOUR program will look like!